DEC’s 32-bit VAX architecture saw many implementations since its introduction in 1977. 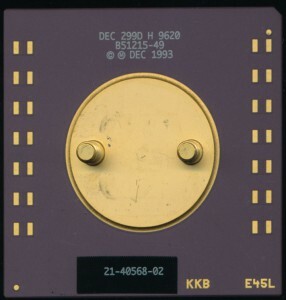 Early implementations were all multi-chip, but as technology improved the VAX architecture could be implemented (at least partially) on a single VLSI chip. 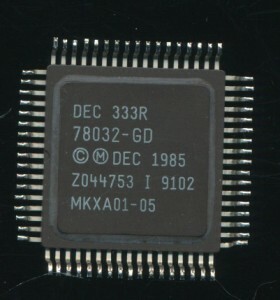 The first implementation on a single chip was the MicroVAX II released in 1985. It contained 125,000 transistors, made on a 3 micron NMOS (DEC proprietary ‘ZMOS’) process and ran at 5MHz (200ns cycle time). In 1987 DEC released the CVAX, the second generation VAX on VLSI. The CVAX was made on DEC’s first CMOS process, a 2 micron design using 175,000 transistors and clocked from 10-12.5 MHz (80-10ns cycle time). 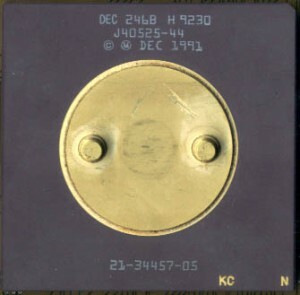 The input clock was a four-phase overlapping clock (so input frequency was 4x the cycle time, or 40-50MHz). Performance was 2.5-3 times better then the MicroVAX II. About half the gain was from process improvement (increased clock speed), while the rest was from architectural changes (mainly pipelining). As the CVAX (and its successor the CVAX+) were released the next generation was already being designed by DEC. This was to be Rigel. Rigel has a 6-stage pipeline, and was made on a 2 micron CMOS process and the CPU contained 320,000 transistors, 140k of which were for logic, while the remaining 180k were for memory (cache). 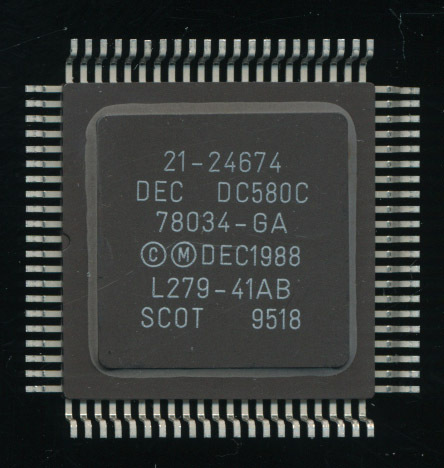 The separate FPU chip contained an additional 135,000 transistors. After some early teething pains on the new CMOS process, where yields were almost non-existent, the process finally was refined enough to make commercial samples by late 1988. The target speed for Rigel was a 40ns cycle (25 MHz clock). This would give the Rigel a 6-8x performance gain over CVAX. 2X of this was from the process shrink (and doubling of clock speed) while 3X was from the improved pipelining. The remainder was due to increased memory performance, not the least of which was due to Rigels 2KB of on chip cache. In the mid-1970’s DEC saw the need for a 32-bit successor to the very popular PDP-11. They developed the VAX (Virtual Address eXtension) as its replacement. Its important to realize that VAX was an architecture first, and not designed from the beginning with a particular technological implementation in mind. 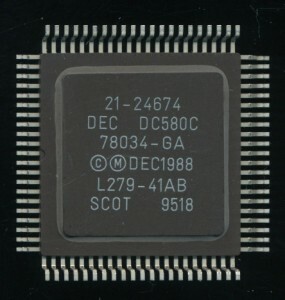 This varies considerably from the x86 architecture which initially was designed for the 8086 processor, with its specific technology (NMOS, 40 DIP, etc) in mind. VAX was and is implemented (or emulated as DEC often called it) in many ways, on many technologies. The architecture was largely designed to be programmer centric, writing software for VAX was mean to be rather independent of what it ran on (very much like what x86 has become today). The first implementation was the VAX 11/780 Star, released in 1977, which was implemented in TTL, and clocked at 5MHz. TTL allowed for higher performance, but at the expense of greater board real estate as well as somewhat less reliability (more IC’s means more failure points). It also cost more, to purchase, to run, and to cool. DEC followed the Star with the 11/750 Comet in 1980. This was a value version of the Star. It ran at only 3.12MHz (320ns cycle time) but introduced some new technology. Part of the ‘value’ was a much smaller footprint. The TTL had been replaced by bi-polar gate arrays. Over 90% of the VAX architecture was implemented in the gate arrays, and there was a lot of them, 95 in a complete system with the floating point accelerator (28 arrays). The CPU and Memory controller used 55 while the Massbus (I/O) used an additional 12 gate arrays. The 95 gate arrays though replaced hundreds of discrete TTL chips. And as a further simplification they were all the same gate array.